We ask you "Did you experienced an exceptional recruiting innovation in your daily recruiting as an corporate recruiter or are you an solution provider with an eruptive solution to talk about?". Looks like you did, since you have provided quite some highly interesting recruiting innovations. Some are coming from inside of corporate recruitment teams, some have been nominated from enthusiastic users and some from the proud innovators themselves. Now it's up to the recruiters in Europe to choose the 5 that will be allowed to enter the Recruitment Innovation Battle at the end of the RIDE: Recruiting Innovation Day Europe on the 8th of April in Zurich. Here you will find the name of the innovation, a brief description of it and some reason why you might want to vote for them. Select you favorites! The top five selected by you are then invited to compete in the Recruiting Innovation Battle on the RIDE in Zurich, each given a timed, 8-minute recruiting innovation pitch before the RIDE audience. If you would like to join the RIDE and learn more about recruiting in Europe yourself, please find here more info and a registration possibility. OneDaywith, Cammio Video Recruitment, 'unrecruitment, BetterHeads and Swisscom New JobPostings in the Recruiting Innovation Battle on the 8th of April at the RIDE-Recruiting Innovation Day Europe on the PersonalSwiss in Zurich. Betterheads Worldwide first B2B online platform dedicated to identify, hire and rate the suitable headhunter in the executive search industry. Additional process control allows KPI based reporting. The search is based on the headhunters' experience which is composed of successful placements rated and verified by their clients. First mover acknowledged and accepted by all stakeholders (headhunters, companies, press), able to close the gap of online recruiting by clearly positioning itself on the executive search industry and respecting their rules. BetterHeads, which went live in 11/2013 could be able to change the game play of an entire industry by simply making it transparent. Pre-screening job interviews are one of the last areas in the recruitment process that can be digitalized. They also generally consume the most time for both recruiter, hiring manager and candidate. Cammio helps candidates and employers towards better hiring matches with a visual first impression. Cammio is a powerful cloud-based video recruitment platform that uniquely combines live and structured video interviews within one integrated platform. Both in terms of functionality and usability it is the market leading video recruitment platform in Europe with clients such as ManpowerGroup, Dutch Railways and T-Mobile. Every month, HR marketers and recruiters invest significant time and resources to generate online and offline interactions with thousands of candidates for positions in their companies. Candidate engagement automation ensures that relevant candidate contacts are not lost but inspired to apply. We're incredibly passionate about reinventing the way developers find jobs and how companies hire developers. In the future this will be key for recruiting developers. Eqipia puts the team in the center of the recruiting process: Companies can use the employees' networks to reach passive job seekers and the applicant sees his future team on the job ad and can find mutual contacts. Eqipia ends the «post & pray» mentality of traditional postings on job boards. The team becomes actively involved in the recruiting. Science proves that referrals from the network lead so better matches and those employees are sooner productive and more loyal to the company. Unique in the world, OneDayWith is 100% in line with the way talent behaves on the web. They want to go beyond corporate marketing and get insight, transparency and interaction with future colleagues and boss. Signal™ is a Talent Relationship Management System which delivers predictive recruitment analytics and notifies when to contact prospect candidates with offers based on the likelihood of whether and when a person is willing to change their job, and who to contact first. So recruiters don’t have to waste time cold calling or sending unproductive emails to random people. Signal is automatically tracking all online behavior patterns of the people you are interested in - It focuses specially on their behaviors that are most relevant for the purposes of recruitment and talent management - Signal provides you with relevant real-time information about which people are seeking employment on a scale ranging from passive to active. - Signal is compatible with many social media sources - Signal™ truly represents an orders of magnitude leap of innovation. 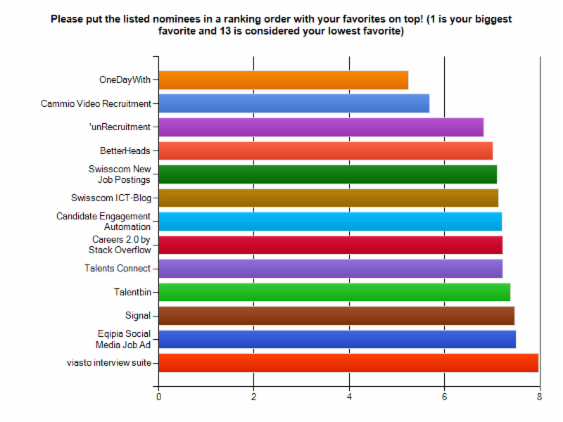 The recruiting blog ict.swisscom.ch is an innovative interpretation of Swisscom’s CI. Also the blogger team consists of 40 experts from all over the company’s ICT areas. This openess (anybody is allowed to publish) and engagement is remarkable. The blog reached 30k readers within 1 year. ict.swisscom.ch is a rare example how companies should act to win new employees not by talking about recruiting topics, but about new trends and hot topics within the area of interest (in this case: ICT). Furthermore it is remarkable that such a broad bloggership can be established with ambassadors. The new Swisscom job postings innovate nearly everything: new design, interactive features, modern and emotional language, multimedia and reference to other job postings, platform independent. Live since 2 months now, the new format already considerably increased the number of applications. In my view it is THE innovation in the field of online recruiting: It rethinks the way how a job positing is structured, which information and formats are provided and before all, how people are addressed - with a modern, personal and strong language. Talentbin enables to see all of the social footprints of my candidate on 1 page, as well as shortens the whole process to effectively leverage this information to access them - and all in 1 place. TalenBin is the FUTURE in recruiting - encompassing BIG DATA and HR. Talents Connect designed an innovative recruiting product, aggregating hard & soft skills into one simple matching score. This matching score illustrates how well an applicant fits to a company and their job openings, by taking a wide variety of criteria into account. As a first step, a short, innovative survey needs to be completed by an applicant or by a company, in any language whatsoever. Directly after finishing the survey, the demands and wishes of that user are paired to their closest matching counterparts. Thus, with less effort, time and money, applicants and job offers can now be matched on a larger scale than traditional recruiting. This mechanism not only holds the potential of scaling up the amount of potential applicants, but also brings an incomparable quality of applicants, yet to be seen in today’s recruitment process. Talents Connect embodies a revolutionary tool combined with the right technology. Above all, Talents Connect is built with and around an outstanding team spirit. The technology has the power to build bridges between different languages and nations and can efficiently fill the gap between demand and supply not only among European countries, but also when it comes to connecting Europe on an international level. Recruitment has taken a long journey. Today the individual seeks for his/her personal fulfillment rather than simply for a job. We want to feel comfortable at our job so that we can rise up to our fullest potential. On the other hand companies have understood, that it is important than ever to find the very best candidate for a job offer so that the company can excel. Resulting, there is the need for a tool that can grasp more information than conventional tools do and represent this information in an efficient way. That tool would most definitely be at the right place at the right time. And that tool is no other than Talents Connect. unRecruitment Through a multistage selection event, candidates took responsibility to select themselves for the internships on offer. Elemental fostered an honest dialogue, through which everyone was empowered to understand what skills they really offer and which jobs would suit their potential. This wasn’t about winning: it was a voyage of self-discovery. Our eyes were opened to people who we would not normally consider. They all developed through the event as they gained greater self-awareness; all benefited, whether or not they secured the internship. We ended up hiring more people than planned and, several months later, they are all here, delivering and showing great promise. An amazing experience. viasto interview suite Competency-based evaluation is crucial for the quality of personnel selection processes. The interview suite is a software for asynchronous video interviewing allowing recruiters and hiring managers observation-based assessment of applicants’ competencies in the earliest screening phase. For the first time, competencies can be evaluated in an asynchronous format. Result: Valid selection decisions and efficient processes. viasto is the only provider of competency-based asynchronous video-interviewing. The structured interview process and observer-based assessment of candidates not only allows for valid selection decisions, but also helps reduce the time of a hiring process. Moreover, it ensures a fair process for every candidate and thus takes diversity in personnel selection to the next level!